For me, shorts are one of the most important pieces to own during the summer (right behind a good swimsuit). I love denim year round & in the summer, I reach for this pair of denim shorts just about EVERY weekend. I swear I think they get better with age. This week show us how you style shorts for summer in the Start The Week Stylish link up! I finally got my hands on another pair of Soludos! I love these limited edition Jeff Divine photography espadrilles - they are literally absolutely perfect for the summertime & beach days since they have surfers printed right on them! PS. I want to take a moment to THANK all of you who have participated in the link up over the last few weeks! I am amazed at how quickly it has grown and how many new people link up with us each week! To thank you, Ana Luiza and I will be sharing some of our favorite looks from the previous theme each week. 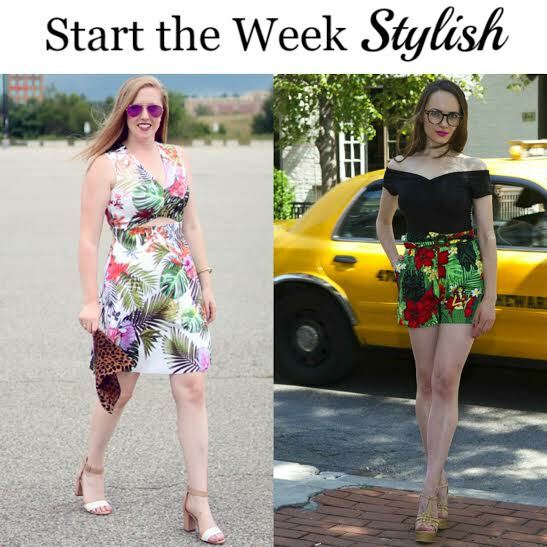 Last week we loved how Kristy from Style-Blueprint & Katya from Style Sprinter styled their summer prints! Those espadrilles are SO fun! And those are the perfect denim shorts!! It is the epitome of easy summer style. I love this summer look - your shoes are so fun! This is a super cute look! I love it! Thanks so much for featuring me! I am so excited!!! yay! BTW your outfit is amazing! I especially love those adorable espadrilles. So summery and chic! Congrats on being featured! We loved your printed shorts! Love this link up! That white top looks gorgeous on you, I'm all about off the shoulder pieces this season. So glad you are enjoying linking up! Hope you gain LOTS of style inspiration! Love your top and those espadrilles!!! Great summer look Michelle! What a cute outfit! I love the cutouts on the shoulders of this shirt. Those are the perfect shorts! I love the top too. Off the shoulder without having to deal with strapless. I will be sure to check out your latest post! The outfit is some simple but cute but those sunnies!! Tooo freakin cute!! Wow THANK YOU so much! Please send me the link once the post is live! I totally agree with you! I wear this pair nonstop! Such a cute look! I'm loving all the details! I am seeing David Yurman on everyone! I want some! Super cute look and I am checking out the shorts now.